William Blake (1757–1827), The Sun at His Eastern Gate (Illustration for Milton's 'L'Allegro') (c 1816-20), pen watercolour on paper, 16 x 12.7 cm, The Pierpont Morgan Library, New York, NY. The Athenaeum. This article considers some of Blake’s watercolours which I find particularly appealing or interesting, but which have so far not been covered properly in previous articles. I consider them in chronological order. 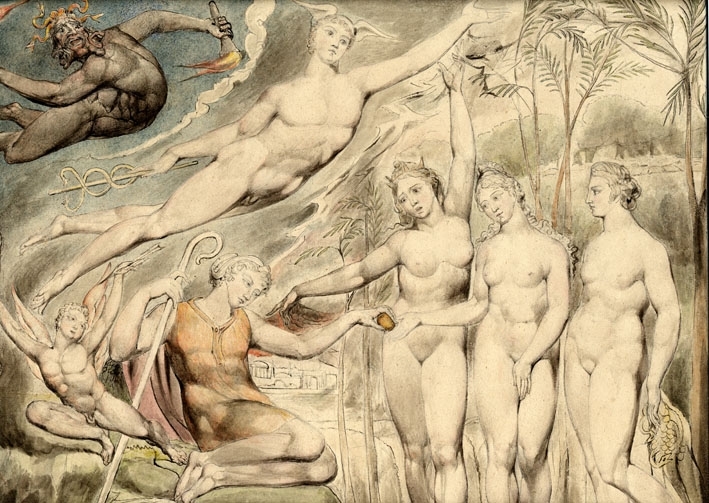 An Allegory of the Bible (c 1780–5) is one of Blake’s larger and earlier watercolours which does not yet appear to have been securely identified. William Rossetti apparently gave it the title of The Pilgrimage of Christiania, presumably referring it to the second part of John Bunyan’s The Pilgrim’s Progress, but it does not appear to have any related works until Blake started his series of illustrations to the first part of Pilgrim’s Progress much later. Bindman considers that it shows a school in which its pupils are working from books under angelic instruction, although none of the figures shown has wings. He suggests that it may be an allegory of the letter and the spirit. Butlin prefers the more generic title An Allegory of the Bible, for which the Tate supposes that its theme seems to be the revelation of knowledge. The open book seen in the distance is presumably the Bible, which attracts the attention of several of the figures. Two of the apparently instructional groups of women and children are working from their own open books. In the foreground, a fair-haired woman is walking down a flight of steps to greet another woman who has brought a girl with her. The decoration on the wall in front of the Bible appears incomplete. On the left, it contains symbols which are most probably those of two of the astrological/astronomical constellations or heavenly bodies, such as the ‘signs of the zodiac’. It is likely that Blake painted this with a view to engraving it, as it probably dates from his partnership with James Parker to make and sell prints. Alternatively it may have been aimed at Boydell’s Shakespeare Gallery which had just been announced. Its sinuous curves are those popular with print-makers, and reflect Blake’s recently-completed apprenticeship. Its present fine condition is a result of the work put into its conservation in 1973. Age Teaching Youth (c 1785–90) is a third early watercolour, smaller than the previous two, which appears unassociated with any series or commission. It shows two young people, possibly a boy and a girl but I think two girls, being taught from a book (the Bible) by a much older man who has the appearance of a prophet. The girl sat behind, who is looking at the pages of the book, points upwards, probably referring to the Kingdom of Heaven and the Christian concept of ‘everlasting life’. The young person in the foreground is finished in greater detail, and wears clothing of strikingly modern appearance. Their robe or dress bears a leaf and tendril motif, which usually indicates that their mind is limited to nature and its imitation; they are also drawing, rather than attending to the teaching from the book. Malevolence, subtitled A Husband Parting from His Wife and Child; Two Assassins Lurking in Ambush, was painted as a commission for the Reverend Dr. John Trusler, who compiled a large number of moralising publications. 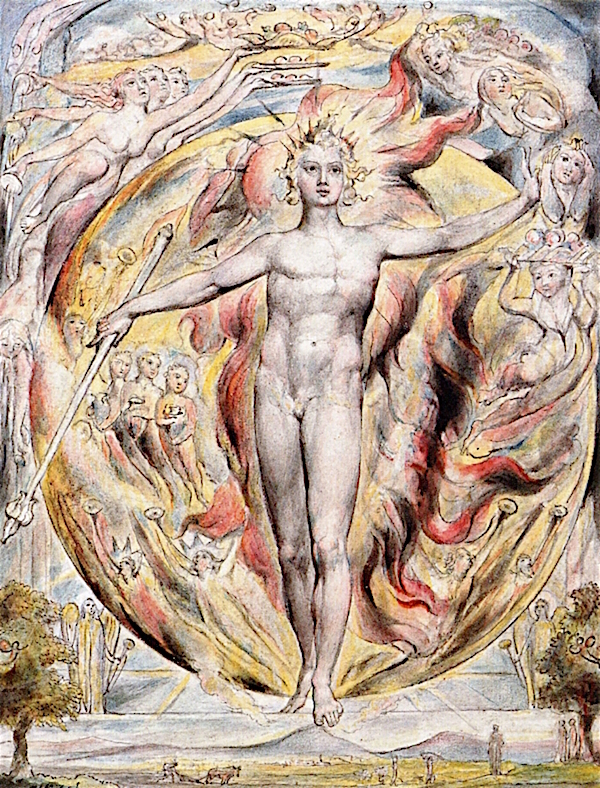 It was probably intended to have been the first of four such works, showing the themes of malevolence, benevolence, pride, and humility, which Blake would presumably have then engraved for publication. 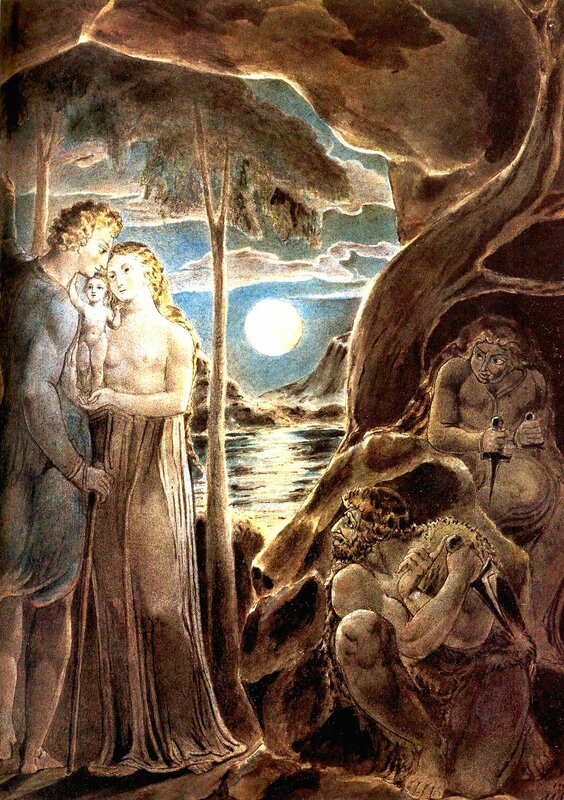 The resulting watercolour is one of Blake’s most intense and beautiful, and shows how his work might have inspired the paintings of younger artists such as Samuel Palmer. It was unfortunately not the simple, Hogarthian image which his patron had expected. Although Blake reassured Trusler that he “had been compell’d by my Genius or Angel to follow where he led”, it was eventually rejected, leaving Blake to accuse him of having “fall’n out with the Spiritual World”. The other three works were presumably also cancelled. 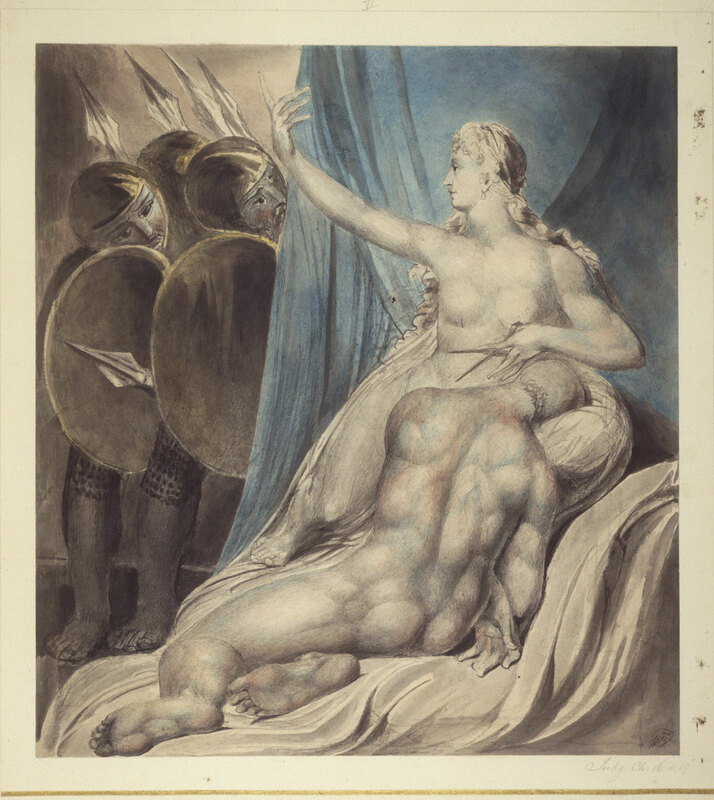 William Blake (1757–1827), Samson Subdued (c 1800), pen and ink and watercolor over graphite on paper, 39.1 x 35.2 cm, Philadelphia Museum of Art (Gift of Mrs. William Thomas Tonner, 1964), Pennsylvania, PA. Courtesy of Philadelphia Museum of Art. And when Delilah saw that he had told her all his heart, she sent and called for the lords of the Philistines, saying, “Come up this once, for he hath shewed me all his heart.” Then the lords of the Philistines came up unto her, and brought money in their hand. And she made him sleep upon her knees; and she called for a man, and she caused him to shave off the seven locks of his head; and she began to afflict him, and his strength went from him. And she said, “The Philistines be upon thee, Samson.” And he awoke out of his sleep, and said, “I will go out as at other times before, and shake myself.” And he wist not that the Lord was departed from him. Although it is clear from the text that it was “a man” who removed Samson’s hair, Blake follows the popular version which makes for a stronger narrative painting. His depiction is also surprisingly explicit in showing the couple naked together, and shows the Philistines upon Samson when that was used as a trick to awaken him. 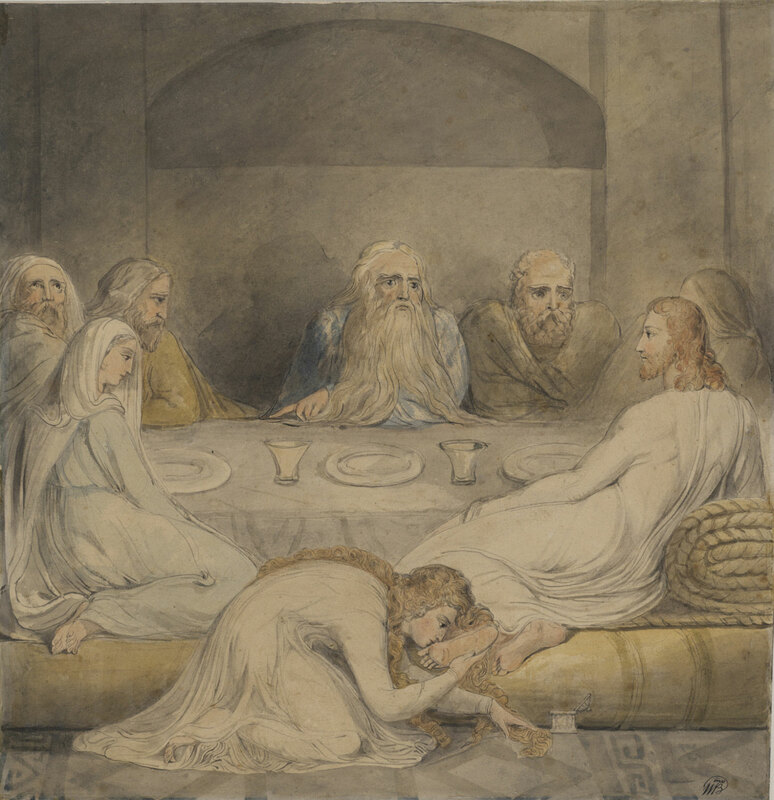 William Blake (1757–1827), Mary Magdalene Washing Christ’s Feet (c 1805), pen and ink and watercolor over graphite on paper, 34.9 x 34.6 cm, Philadelphia Museum of Art (Gift of Mrs. William Thomas Tonner, 1964), Pennsylvania, PA. Courtesy of Philadelphia Museum of Art. Presumably the man sat in the centre, wearing blue, is intended to be Lazarus, although Blake gives him the look of Urizen, perhaps. Mary and Jesus look awkward together: it has been proposed that this results from meanings which Blake attached to left and right, but here it is almost inevitable given the composition. This does, though, provide a full view of the curved and compacted figure of Mary, and her wiping of Jesus’ feet using her luxuriant and curly hair. Blake avoids making any reference to Judas’s intervention. William Blake (1757–1827), The Judgement of Paris (1806-1817), pen and grey ink and watercolour over graphite on paper, 38.5 x 46 cm, The British Museum, London. Courtesy of and © Trustees of the British Museum. Better known for these many paintings of biblical scenes, Blake still painted plenty of secular stories, including The Judgement of Paris (c 1806-17). Bindman and Butlin believe that it was one of a pair for Thomas Butts, the other being Philoctetes and Neoptolemus on Lemnos, a rather more obscure story which led to the death of Paris. 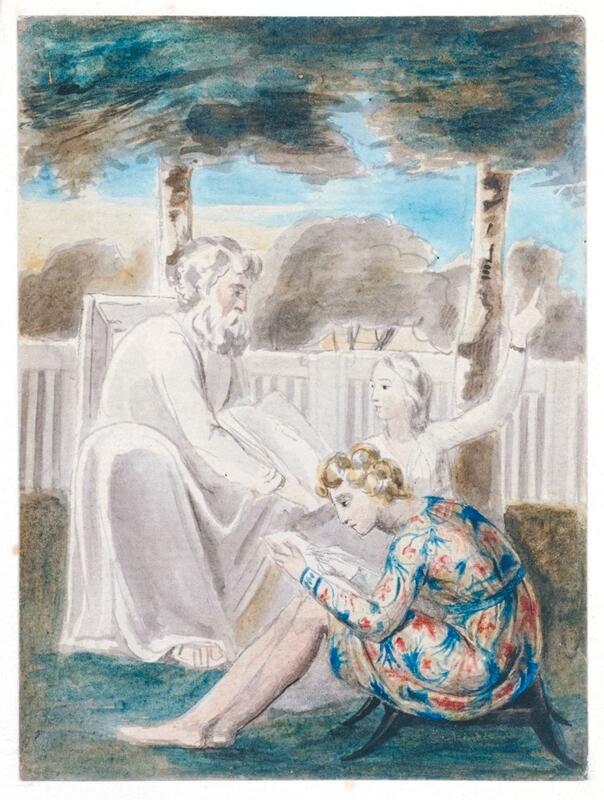 This is a very curious story for Blake to have painted, particularly for a patron who by this time had over a hundred of Blake’s watercolours showing biblical scenes. The underlying narrative is very well known and popular: three famously beautiful goddesses, Hera, Athena, and Aphrodite, claimed a golden apple from the Garden of the Hesperides as a prize for the fairest one. Zeus decided that Paris would be the judge. Hermes then guided the three to bathe in the spring of Ida before they presented themselves clothed in front of Paris. When Paris was unable to arrive at a decision with them clothed, they stripped and submitted themselves to his inspection, while each offering him bribes. Aphrodite offered Paris the world’s most beautiful woman, Helen of Sparta, the wife of Menelaus, and Paris therefore awarded her the golden apple, leading to the Trojan War, and the death of Paris. As with almost every artist before and since, Blake shows the three contestants naked in front of Paris, just at the moment that the golden apple is being awarded to Aphrodite. Hera and Athena, standing either side of her, are visibly upset. Above them is the naked figure of Hermes, with his caduceus and its pair of intertwined serpents, and a winged helmet (originally a wide-brimmed Petasos). The demonic figure at the top left is presumably a harbinger of the death and destruction that would result. For other artists, the principle attraction of this story is the opportunity to paint three beautiful female nudes, and with them to entice many male viewers. 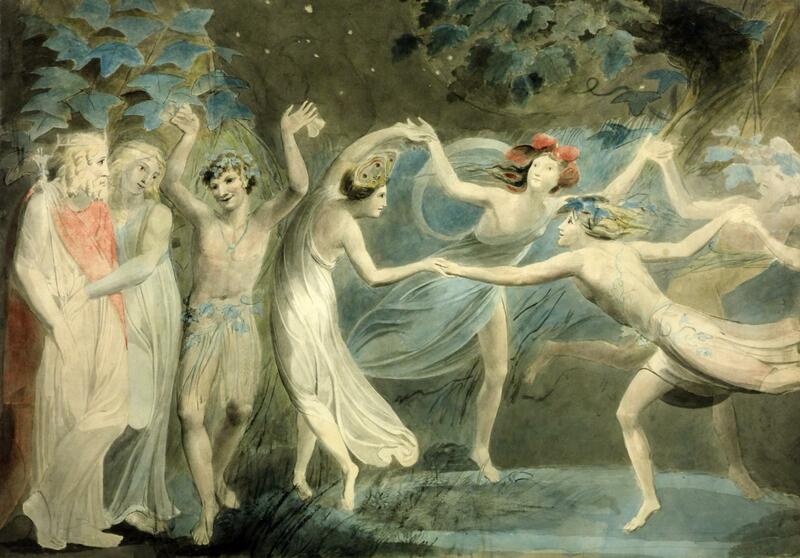 I find it strange that Blake should follow in that tradition, and paint such a conventional work as a result. 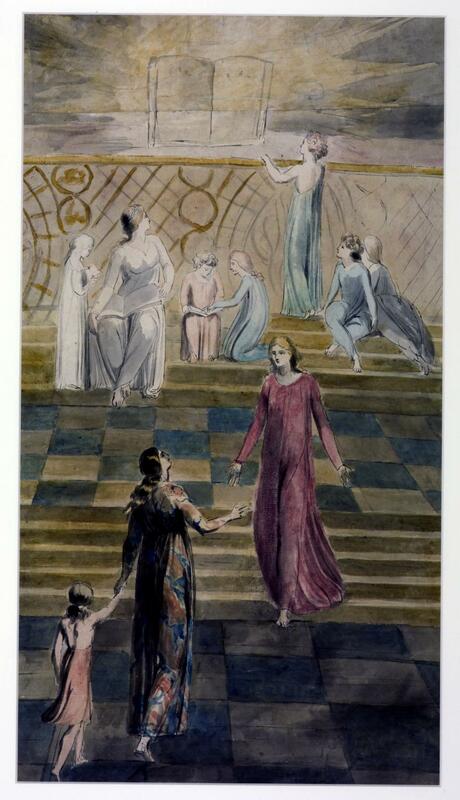 William Blake (1757–1827), The Sun at His Eastern Gate (Illustration for Milton’s ‘L’Allegro’) (c 1816-20), pen watercolour on paper, 16 x 12.7 cm, The Pierpont Morgan Library, New York, NY. The Athenaeum. The Great Sun is represented clothed in Flames Surrounded by the Clouds in their Liveries, in their various Offices at the Eastern Gate. Beneath in Small Figures, Milton walking by Elms on Hillocks green. The Plowman. The Milkmaid. The Mower whetting his Scythe. & The Shepherd & his Lass under a Hawthorne in the dale. 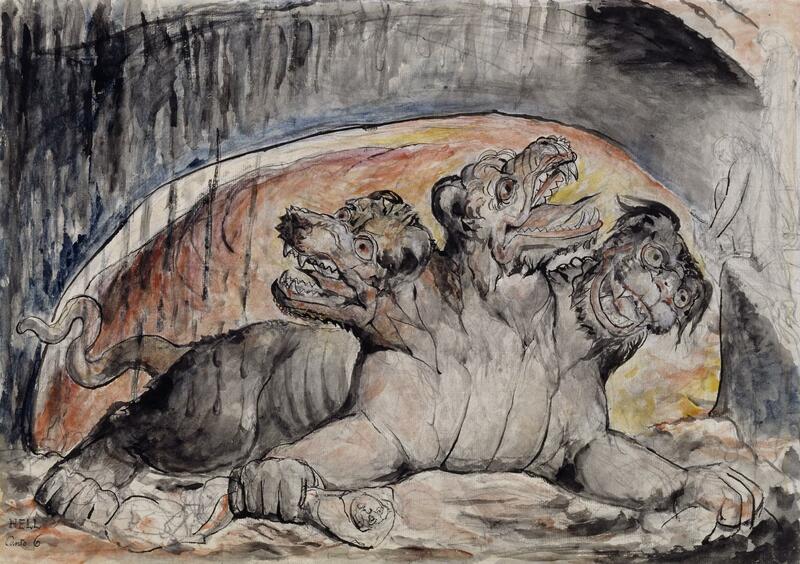 Cerberus is the horrifying three-headed canine monster shown in Blake’s late illustrations to Dante’s Divine Comedy, painted between 1824–27. This refers to Dante’s Inferno, canto 6 verses 12-24, where Dante and Virgil enter the Third Circle, in which gluttons are punished. Blake is true to his source, except that he adds a cave to signify the weight of the material world. There are two versions of this painting: this in the Tate, and another in The National Gallery of Victoria in Melbourne, Australia. Cerberus is a good example of the redeployment of pre-Christian mythology into Christian beliefs: it was originally the guardian of the Underworld, and prevented those within from escaping back to the earthly world. It even features in the twelve labours of Heracles (Hercules), in which he captured Cerberus. Dante – with Virgil’s explicit involvement – incorporates it into his Christian concepts of the afterlife. Most recently, Cerberus has been used in a more faithful transliteration from the Greek as Kerberos, a computer network authentication protocol. Such are the changes that have taken place in human mythology. Posted in General, Painting and tagged Blake, Dante, Milton, narrative, painting, Palmer, Shakespeare. Bookmark the permalink.